Home Resources What is Epigenetics? Ask and you shall receive. The “What is Epigenetics?” blog provides a plethora of articles to answer that very question, with particular emphasis on relating recent research findings to aspects of everyday life such as exercise and Halloween candy. Included on the website is an informative “crash course” on epigenetics under the “Learn Epigenetics” section of the site that consists of a text description and keyword definitions. The remainder of the site is composed of various articles that are organized into four types: news and reviews, educationally entertaining, tools and technologies, and tips and techniques. 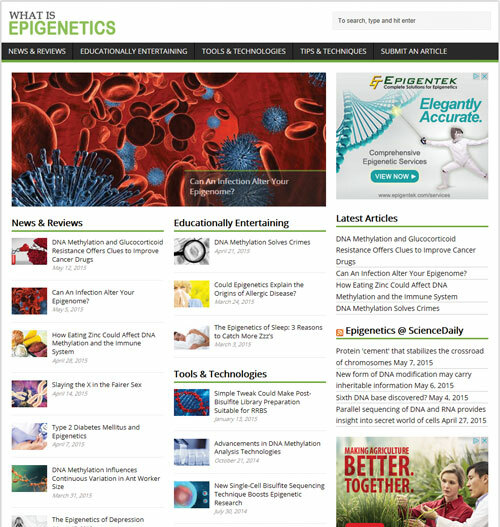 Titles of the articles range from “The Epigenetics of Depression” to “New Single-Cell Bisulfite Sequencing Technique Boosts Epigenetic Research.” While little-to-no information on the authors’ credentials or identities is provided, the blog articles do include citations and links to original research articles.